Canada's Toronto Pearson International Airport, along with millions of people in Eastern Canada and eight US states, suffered a severe electrical power outage in 2003. This catastrophic failure made it painfully apparent that the airport needed a reliable, independent source of electricity. Round-the-clock reliability was simply an absolute must, but the economics of such a system had also to be carefully considered. These two factors – reliability and costs – have now been met by a cogeneration power plant design using twin GE LM6000PD aero-derivative gas turbines, each capable of producing 42 megawatts. Exhaust from the turbines passes through steam generators which run a third steam-driven generator capable of 33 megawatts output. Remaining plant heat can be used to heat/cool the airport buildings. Economics were addressed in this generous design to allow sale of excess power generated to the Ontario power grid. A Yokogawa CENTUM CS 3000 control system, selected after careful evaluation of system reliability for various vendors, completes the plant. "Those involved with the Cogen plant have been very pleased with reliability of the Yokogawa control system," states Henry Oberhauser, Senior Manager, Utilities for GTAA. "The only substantial system outage occurred due to sub-standard process water supplied by a sub-contractor. We feel Yokogawa's claim of 'seven 9's' reliability—which translates to less than one minute of downtime in 40 years—is well on its way to reality." The airport is owned by the Greater Toronto Airports Authority (GTAA)¹ , which hired outside firms to help design, build, and operate the plant. The airport, by meeting the twin requirements of a coincident demand for electricity and thermal power along with access to fuel (natural gas), was an ideal candidate for a Cogeneration system. 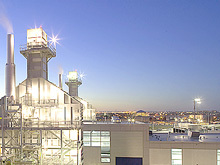 In early 2001, GTAA had constructed a Central Utility Plant for the airport; it replaced a legacy plant torn down as various airport facilities were being added. The plant supplied steam for heating and chilled water for cooling the airport terminals. This new plant can supply steam needs but also allows the optional operation of the plant's steam boilers in standby mode while using steam from the Cogen system. The plant was constructed in 2003. A year later the Yokogawa control system was commissioned. An interesting facet of the design is the use of two "once-through steam generators" (OTSGs) supplied by Innovative Steam Technologies (IST) of Cambridge, Ontario. These units offer several advantages over conventional designs. They are efficient, flexible and capable of full operation from cold starts within less than 30 minutes. They start, run and finish dry. Conventional-pass stacks, diverter valve systems and stack silencers are not needed. An OTSG is basically a heat exchanger composed of a series of tubes whose boiler water is simultaneously heated, evaporated and superheated. Heat recovered in the OTSG supplies the steam turbine at its required temperature and pressure. ¹ GTAA operates Pearson Airport, an international gateway with 65 airlines via 82 gates in three terminal buildings. A fourth terminal is currently being designed. The airport generates $14-billion in annual revenues, $2.8-billion tax revenues and provides 135.000 jobs. It has 16,000 parking spaces. Encompassed by the Yokogawa monitoring and control system is the entire Cogen plant including the two OTSGs. Startup, operation and shutdown of the OTSGs is fully automatic. The complex logic involved was developed by close cooperation of Yokogawa, IST and SNC-Lavalin² engineers. Here is operator Steve Sadecki in the Cogen Plant control room with multiple flat-screen displays. 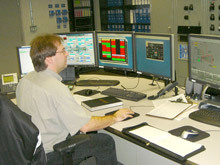 Control is provided for plant balance and unit operations. Monitors provide rapid and complete displays of all system assets. Says Sadecki, "The display formats are very well thought out and extremely operator friendly. It took me, and fellow operators, less than a week of training to be completely familiar and comfortable with the system – even though none of us had previous experience with Yokogawa equipment." Not shown but also in the control room is an engineering station. It allows access to technical drawings and related information such as applicable codes and standards and other engineering information. It includes a system simulator used in operator training and to examine and test changes in the CS-3000 logic. This logic can be modified through this station. A HART plug-in allows diagnostics for HART I/O. Naturally, access to the station is fully protected and limited to only the plant's certified engineers. A monthly printout – both tabular and graphical – by a companion J.D.Edwards software package, using selected inputs from the Yokogawa files, provides maintenance guidance. 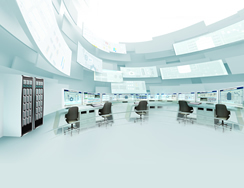 Since installation of the Yokogawa system, no major maintenance has been required. Steam fed to the OTSGs must be of ultra-high quality. Steam monitoring and water purification control is included in the CENTUM system. ²SNC-Lavalin, one of the leading groups of engineering and construction companies in the world, has office across Canada and in thirty other countries. It is at work in over 100 countries. The Honourable Donna Camsfield, Minister of Energy, at the Cogen Plant opening on Dec.2, 2005, said in part, "Today's plant opening is another step in Ontario's cogenerational potential and another example of the Greater Toronto Airport Authority's significant record of environmental leadership." Increases the number of facilities that recover quickly or even continue to operate in the event of power interruption. Comments by those associated with the plant and echoed by other industry and government groups visiting the Toronto facility – about two such tours per month since installation – attest to the central focus of system reliability. The GTAA facility and its Yokogawa control system qualify on all counts.